WELCOME to the 21th issue of BYMRr-Zine - a newsletter published by Building Your Model Railroad, and devoted to providing breaking news and tips to model railroaders of all ages and all scales in a quick and easy-to-read format. Resources are always credited where appropriate. 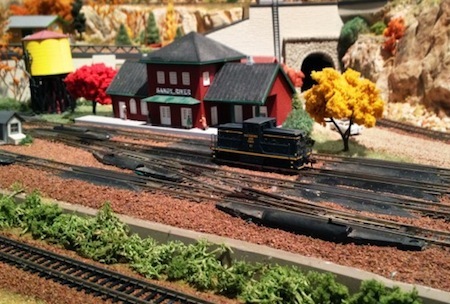 After visiting a large well-done model railroad, or after reading major model railroading magazines, many of us are inspired to stake out a room in the house and make plans for a large model railroad of our own. The planning and initial building process is exciting, but it soon becomes clear that building a large layout requires more time, effort and money than many can afford. 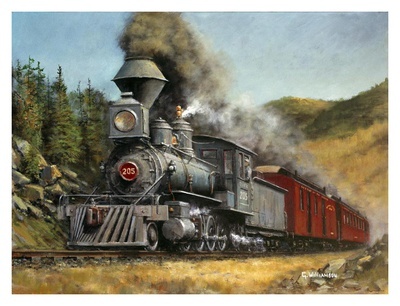 If you are retired and can spend several hours a day working on your masterpiece, or if you have 2 or 3 other model railroaders that you can enlist to help you build it, everything should work out very well. If you are working on this by yourself and have a job or career to maintain, you may run into the frustration of making extremely slow progress. If you have the patience to make this a lifelong project, you may be okay with that. If not, you may want to be careful in the early planning that you don't bite off more than you can chew. This is probably one of the biggest mistakes novice model railroaders make when starting out. It may be wise to consider your circumstances carefully before you decide how you will approach your design and planning. 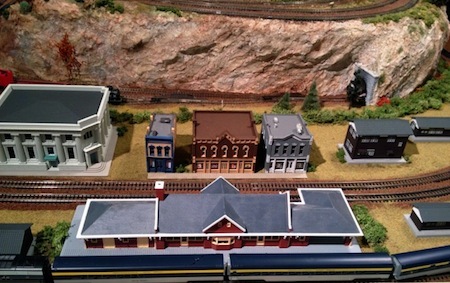 As a lone model railroader, you can have a lot of enjoyment with a small layout over many years. You can always make big plans, but starting the actual building of the railroad in small sections may make the most sense. Consider starting with one corner or one end of the layout. Make it interesting enough that operating trains will be fun. Once you finish that section, then you can add more sections that will gradually grow your layout into the large empire that you dreamed about in the beginning. In the meantime, you will still have a small portion of the layout finished with running trains that you can enjoy while you're working on the rest of it. Wiring for DC is more time consuming and requires more wire, but the power sources (transformers) are cheaper and less complicated to set up. The DC locomotives are less expensive than ones equipped with DCC decoders, but with DCC, the trains are much easier to control and operate much more realistically. Installing decoders in locomotives can be a challenge with DCC, not to mention the learning curve in changing decoder functions and variables and trying to figure out how everything works from complicated manuals. DC locomotives usually work very well right out of the box. DCC locos sometimes do as well, but often need tweaking, reprogramming, etc. See the section on Model Railroad Wiring for more information. This is another option that may actually be the best way to go. Most of us have an old computer that we didn't know what to do with after we upgraded to a new one. If you haven't given it away yet, get it out and clean it up. Use a clean-up program to get rid of old files, old start-up programs and duplicate files, and uninstall anything you don't really need. Then consider installing one of the several programs available now to help you run your trains by computer. I don't have any personal experience with any of these programs except that a friend has been using the Train Brain CTI program very successfully for several years now. He's very happy with it, but he'll be the first one to tell you that setup was not easy. The CTI program may have improved somewhat since then. Some of the newer programs seem to take the headache out of the setup process as well. The hardest part is creating your track plan on the computer, then the program can automatically figure out the different routes your trains can make and can then program those routes for you. First make a design for a stone structure or use a reference photo of one that you want to model. Create the walls for the structure using styrene sheets as described on the Scratchbuilding page on the BYMRR.com site. Purchase Chooch flexible stone wall in the appropriate size and scale. And finally, attach the Chooch material onto the walls that are going to be the stoney part of your structure. Reference: "Scratchbuilding Stone Walls", by Greg Condon, Railroad Model Craftsman, September, 2012, pp. 56-57. This is actually pretty easy to do these days with the advent of cameras installed into smartphones. If you don't have one of those, just use a point-and-shoot digital camera. The point here is to keep it with you both in the layout room and whenever you go on a road trip with the family. It's actually a great way to combine two hobbies into one. In the layout room, take a lot of pictures of your progress. Put them on your computer, make a screen saver out of them. They will remind you and inspire you to keep working on your layout and help you find ways to make it better. You may see things in your pictures that you don't notice when looking at your layout, especially if you take the pictures from different angles that are not your usual viewpoint. When I did this once I found that many of my buildings were not attached very well to the ground. There were many very unrealistic spaces between the foundations and the ground that I hadn't noticed before. You may find that the lighting in one area is not as good as the lighting in other areas, or there may be large spaces that appear to be unfinished. You may think of interesting or humorous details that could be added to a scene as you look at your pictures later. You could take your pictures and show them to friends to show them what you've been up to, or to ask them what they would do to make a scene look better. On the road, you will see many rural or city scenes that you may want to model. You may find a particular type of old structure that would look great in a certain place on your layout. Take a picture of it and see if you can emulate it with styrene and other materials when you are back at your workbench. If you're lucky, or if you plan for it, you will find railroad stations, trains, tracks and signals to photograph. Try to find a railroad museum that's on the way to your destination. Set aside enough time to stop and photograph it. You can learn a lot about trains by doing this and your pictures will later remind you about what you learned. It's also a great way to get the rest of your family interested in your hobby - maybe. 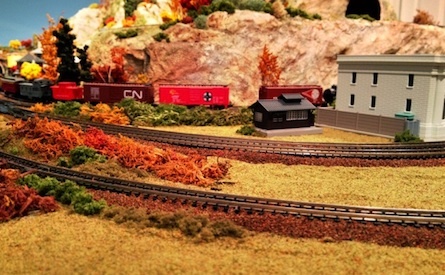 With the Fall season fast approaching, you might want to consider creating a Halloween train diorama complete with a spooky train weaving around haunted houses, graveyards, skeletons coming out of graves, caskets falling out of hearses, ghosts and goblins peeking from around corners, scary-looking scarecrows, trolls guarding bridges, witches on brooms getting ready to take off from rooftops, armies of zombies invading neighborhoods and whatever else your imagination can conjure up. Or, you could do a nice harvest diorama with bales of hay, dried up corn or hay fields containing tractors, combines and farmers working under a deep blue October sky near sunset, trains picking up produce and grain taking then to markets and grain elevators. Use orange lights against the buildings or the backdrop to set the mood. Then get ready for winter with lots of snow, snow plows, MOW (maintenance-of-way) equipment, trains moving through deep snow on each side with only the tracks cleared away, LED-lighted miniature christmas trees, horse-drawn sleighs going over icy bridges, kids making snowmen, ice skaters, skiers, cable cars on ski slopes, snow-covered houses with yellow lights and smoke coming out of the chimneys. Decorate your trains with little wreaths made from pipe cleaners. Use various sound techniques to plays sounds of the season as your trains go by. Use tiny LED lights to make a Christmas "tunnel" for your trains to go under. Take a picture of your winter scene and make a post card or Christmas card with it. One idea for those with permanent layouts is to keep one section of the layout changeable so that it can be varied to fit the season or whatever holiday is approaching. You could make this a lift out section, or just change the scenery right on the layout. You could have 4 or 5 different scenes that could be interchanged in the same lift-out area depending on what season it is. This will help keep your family and friends interested in seeing what's new with the layout as the weeks and months go by. If it's always changing, there will always be excitement and renewed interest not only for others but for you as well.